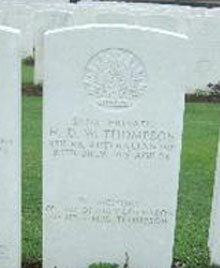 Private Hubert Thompson was the second son of Joseph Thompson and Mrs. Sarah Thompson of Victoria, Australia, and formerly of Windmill Farm, Coagh, Tyrone. He was a nephew of Dr. George Thompson and cousin to the Duff family in Coagh. Hubert was a stretcher bearer serving with the 8th Australian Battalion when he was killed in action on 25th July 1916. Gordon Dump Cemetery is 2 kilometres north-east of Albert, on the right hand side of D929 Albert-Bapaume. At Y junction (102nd Infantry Brigade Memorial) nearby the Routiers restaurant, turn right onto D20 and follow through Ovillers/La Boisselle. After 2 kilometres the Cemetery is signposted onto a 300 metre grass track.